Any individual, family, business or foundation may contribute to the York Suburban Education Foundation (YSEF). Donations of any amount are welcome and appreciated. YSEF is a tax-exempt, nonprofit organization as described in section 501(c)(3) of the Internal Revenue Code. Donations to YSEF may be made online through PayPal, the secure First Giving link, or mailed directly to us. 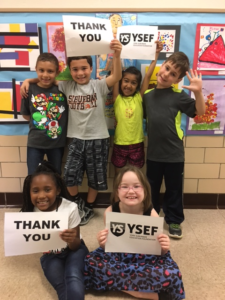 YSEF conducts a fall fundraising campaign, a spring fundraising event with opportunities for event sponsorship, holds restricted named funds, and is an EITC approved organization. For information about funds, please click here.